Lorelei King is one of the most successful and accomplished American actresses working in the UK today. Lorelei King is one of the most successful and accomplished American actresses working in the UK today. She has appeared in numerous film and TV shows, and is a well-known voice on the radio. She is a multi award-winning narrator of audiobooks, a writer, script editor, and co-founder of the digital publishing company, Creative Content Ltd.
Lorelei has appeared in popular British television shows such as Chef, Cold Feet, Alistair McGowan's Big Impression, Emmerdale and the saucy Mile High. She has also made numerous guest appearances in British comedies and dramas such as Jonathan Creek, Not Going Out, The Robinsons and Monarch of the Glen. 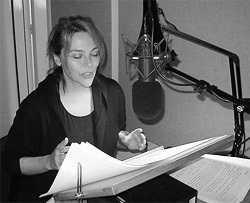 Once described as ‘the best known American voice on Radio 4,’ Lorelei has recorded more than 200 programs for the BBC, including the Marx Brothers tribute, Flywheel, Shyster and Flywheel, super-hero ‘audio movies’ including Superman, Batman and Judge Dredd, and classic American drama such as East of Eden, Ethan Frome and A Thousand Acres.